If you’re considering becoming a professional landscape photographer, or if you’re just interested in seeing how a professional multi-day tour is run, then you might consider applying for this internship. I’ll attempt to pass on some of the hard earned lessons I’ve learned over the past 2+ decades of operating my professional landscape photography business. You’ll work with me as I plan, promote and deliver the 2018 Lake O’Hara Landscape Photography Tour in Yoho National Park. Read on if you have an interest in becoming a fulltime outdoor landscape photographer and if you’d like to spend some time with an established pro in the field learning how to deliver an event to clients during this internship. This internship was created to mentor a new professional photographer, or an advance amateur aspiring to turn pro in the future. The goal of the internship is to expose the successful candidate to the development and delivery of a popular outdoor photography event. By the end of the internship the candidate will have received a good introduction to hosting a professional, multi-day outdoor photography event. 1/ the financial need of the candidate. This is a qualitative requirement and no financial numbers are required to be disclosed about the personal or business finances of the intern applicant. 1/ attend a preliminary tour meeting approximately one week before the tour. During this meeting Brian will explain the preparation and planning stages involved to conceive, develop, organize, finance and host a professional landscape photography tour. Exact numbers won’t be discussed but a “blueprint” of the costing model of an outdoor photography tour will be presented to the applicant. The development of this tour nearly a decade ago, and the development formula used to successfully introduce new tours will be discussed. This will take the format of mentorship using practical examples in an effort to teach the intern how to develop their own successful and profitable events. 3/ Attendance at this meeting is a requirement for thew intern to continue with the rest of the internship at Lake O’Hara. – Assist guests with their needs as needed. This may include, but not be limited to helping the camp manager, or guests, to transport kitchen supplies up to the camp upon arrival, and back to the departure point on the last day of the tour. – Assist with any other tasks as assigned to them. 6/ Interns will be going out on hikes with the guests during the tour. Interns will be assigned to a hike depending on the size of the hiking party involved and at the discretion of of the tour leader. The intern will not be leading the excursions/hikes. They will be “tail guiding” along with one of the other photography tour leaders. Typically on the hike the intern will assume the last position in the line of hiking photographers providing “sweep” at the back of the line making sure that guests at the back stay with the rest of the group. The intern in this role as “tail guide” will ‘discreetly‘ advise the tour staff photographer leading the group if he needs to slow down or if there is anything he should be made aware of. IE: don’t yell to the front of the line that the last person is holding the group up and we need to slow down. Rather than vocally communicating to slow down, discreetly use hand signals when the leader looks back to see how the group is doing. The leader will frequently be looking back to assess the ability and enjoyment of the tour guests. That is, don’t embarrass the guest by yelling to the front of the line to slow down because they are having a hard time hiking. Remember: Guest safety and guest personal enjoyment are the main goals of the tour. 7/ Interns will also be assigned camp management tasks as needed by the tour leaders and by the camp manager and other staff. This internship is a “working position.” There is a modest $250 stipend paid to the intern. And, all of the tour expenses are paid for during the tour. Transportation from, and back to Banff, travel to the backcountry destination, room and board during the tour, any operating expenses and fees as well including Alpine Club of Canada hut fees, park backcountry user passes and travel expenses during the tour if applicable. 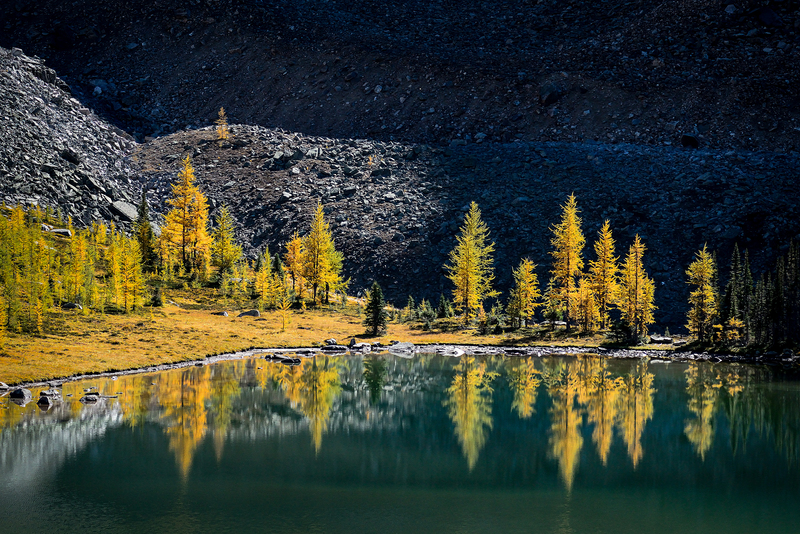 There is one professional landscape photography internship available on the Lake O’Hara Fall Colours Landscape Photography Tour.